This two-way exchange program offers a small group of talented Japanese and American high school students (10 students each) a three-week immersive learning experience in Japan and the United States. In addition to providing participants with an opportunity to experience first-hand school and family life, independent work on self-directed research projects in country also aid the development of cross-cultural, academic and presentation skills. The program benefits Japan by helping to develop a more globally aware cohort of future leaders, and providing them support and opportunities both during and after the exchange program to promote their success. It also fosters development of a sustainable network of highly talented teens on both sides of the Pacific. From March 15 to April 4, 2015, the first part of the two-way exchange program was launched where a group of ten talented Japanese high school students traveled to the United States for a three-week immersive learning experience. While in the United States, the students were able to experience first-hand school and family life and work independently on a self-directed research projects, as well as improve on their development of cultural awareness and presentation skills. The program benefited Japan by providing an environment that cultivated a more globally aware cohort of future leaders and provided them with support and opportunities to promote their success. For the second part of the program, the U.S. delegates will visit Japan in July 2015. As the second part of this student exchange following the Japan to U.S. trip in March, ten American high school students will travel to Japan from July 6-27, 2015. Through cultural activities, a homestay experience, a self-directed research project, and workshops designed to cultivate leadership development, the participants will gain a wider knowledge about Japan as well as become a more globally aware future leaders. During the three-week immersive learning experience, the students will have an opportunity to visit prominent cities in Japan including Tokyo, Yokohama, Kyoto, Nara, and Hiroshima on their study tour. 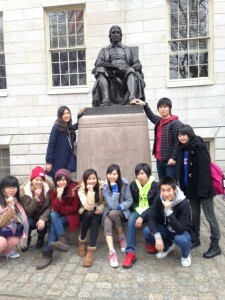 The first part of the 2014 exchanges took place when the Japanese students visited the United States from March 15 – April 4. The ten Japanese participants were selected through a competitive, nationwide application process. The students were placed with host families across four communities in the New York tri-state area (Long Island, NY; Newtown, CT; Old Tappan, NJ; and Belleville, NJ). In addition to the homestay, the group visited cultural and historic sites in New York, they volunteered at the Annual Cherry Blossom Festival held at the United Nations International School, traveled to Boston to visit and learn about American colleges, as well as met with leaders in their field of professional interest. Topics of participants’ independent projects included observations of the host community, American culture, school life, and historical figures as well as what impact this experience might have on their academic or career interests. As the second part of this student exchange, ten American students traveled to Japan from July 1-24, 2014. This program consisted of some sightseeing around Japan, a homestay, and an independent research project based on Japan. After arriving in Tokyo, the students met with their Japanese counterparts and went sightseeing in various locations around Japan, including Tokyo, Kyoto, Hiroshima, and Nara. The participants then commenced their ten-day homestays and began working on their various research projects. For many of the students this was their first time in Japan. Living in a Japanese home, eating Japanese food and being exposed to the Japanese language was an incredibly eye-opening experience for the American students. Through this, they were not only able to learn a lot about Japan, but were also able to look at themselves and their own country through a different lens. For more information on the Japan Society website, click here. After returning to their home schools, the exchange students will, under the guidance of an assigned teacher, make a presentation to other students at their school regarding their exchange experience as well as create an online exhibition about the town and school in which they lived. This program is expected to continue in 2015 and is partially funded through the Fund for Exchanges.